The heart of the home may also be the toughest room to keep clean. Every surface in your kitchen is susceptible to crumbs, dirt, stains and splatters. This is especially true of cabinets. Fortunately, there are practical ways to keep your cabinet maintenance on the lighter side. With ideas like choosing fewer decorative details and picking the right color, these nine tips will make your cabinets easier to maintain. 1. Choose a door style with minimal detail. Raised-panel door styles have nooks and crannies that are magnets for dust and dirt. Shaker-style and slab door fronts don’t, so you won’t have to spend time scrubbing every recess of your door fronts. If you’re designing a traditional kitchen and want a more decorative door style, select a stain or paint that has a glaze. The glaze will fill the doors’ cracks and corners and better hide the dust and dirt that your cabinet doors will collect. 2. Opt for flush cabinet ends. You normally have two options for finishing the ends of your cabinets: flush ends or matching ends. Flush ends (above) are plywood ends that match the color of your cabinets. They are smooth and sleek, which means you can run a cloth over it with a few swipes. They can certainly speed up cleaning. Matching ends feature a panel with the same style as the door fronts, and while they can bring elegance and character to your kitchen, you face the same maintenance issues with matching ends as you do with raised-panel doors. There’s simply more to scrub. 3. Cut the trimmings. Designer details like crown molding, corbels, decorative legs and light rail molding add more to love but also more to clean, especially ornate styles. There are other designer touches you can use that require less maintenance. Try a colorful cabinet paint, eccentric lighting or colored bar stools, like in this modern kitchen. 4. Pick a stain instead of a paint. Stains and paints have pros and cons. They can both show crumbs and fingerprints, and paint definitely shows food stains and splatters. That said, a stain is easier to touch up than paint. You can give a scratched cabinet stain a quick spruce-up with a matching permanent marker. It’s often harder with paint for two reasons. First, it’s hard to find a marker that closely matches a specific paint. Often a touch-up kit from the cabinet manufacturer is needed. Second, paint doesn’t take touch-ups the same way that stains do. You’re more likely to notice a touch-up on paint. 5. Go for a grain with a dark stain. If you’re set on a dark cabinet stain, select a wood species that features the grain, such as oak or hickory. Grains don’t show scratches, stains and crumbs as much as a clean wood species like maple does. It’s also harder to tell that a cabinet stain has been touched up when the surface has grains. 6. Invest in hardware. If you want fewer fingerprints and less wear and tear on your door fronts, purchase door pulls and knobs for all of your cabinets. They help preserve the integrity of your cabinets’ surfaces. Steer clear of stainless steel and chrome hardware. They show fingerprints and water spots and are harder to clean. Oil-rubbed bronze, satin bronze, polished nickel, brushed nickel and white hardware are the cream of the crop as far as easy maintenance goes. Choose the look that best suits the style of your kitchen. 7. Avoid glass door fronts. They may be windows to your kitchen’s soul, but they’re also extra surfaces to clean. They manage to attract their fair share of dust, dirt and smudges. Dirt can build up easily on glass door fronts that feature mullions. You also have to keep whatever is behind those glass doors tidy. One benefit to glass door fronts is how inviting they can make your kitchen space feel. 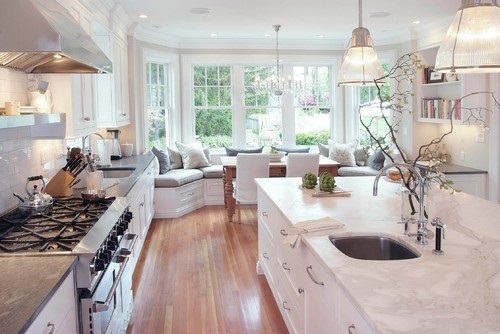 Luckily, there’s more than one way to design a warm and welcoming kitchen. If you want a low-maintenance alternative to glass door fronts, stick with lighter cabinet stains like golden browns. They can make your guests feel just as cozy as glass door fronts do. 8. Reduce open shelving. Open shelving is a great canvas for displaying your favorite decor and cookware, whether it’s on a wall, on an island or at the end of cabinets. But it takes more time and effort to ensure that these spaces are dusted and organized. The upkeep can become overwhelming along with your daily tasks. To shorten your to-do list, place your decor on necessary surfaces like dining tables and countertops instead of unnecessary cabinet shelves. You can also use pillows, chairs, bar stools and lighting as decorative touches. 9. Protect your sink cabinet from moisture. This is more of a preventative measure — it will help you avoid issues down the road. There are a couple of ways to help protect your sink cabinet from moisture. You can order the cabinet with an all-plywood construction (most semicustom and prefabricated cabinets are constructed of a mixture of pressed wood and plywood). An all-plywood construction makes the cabinet less penetrable. You can also purchase a cabinet mat, which looks like a tray and is placed at the base of the sink cabinet. It will serve as a moisture barrier and catch any liquid leaks or spills. Written by Victoria Keichinger, the Brand Engagement Manager with Coldwell Banker Real Estate. She grew up in New Jersey, before attending the University of Miami and still remains a proud 'Cane. Going back to her roots, she currently lives in Hoboken, NJ where she enjoys runs along the Hudson and eating at great restaurants. A true francophile, she loves to travel and will go anywhere there are ski slopes.